I’m returning to a Canadian artist again this week because this work reminds me of two things I think we tend to forget: 1) Photography was an art form that evolved in Canada the same as it did in Europe and the United States (and central and south Americas); and 2) First Nations (Native Americans) are not a purely United States phenomenon. The bands that inhabited the North American continent before European settlement extended from the southern US all the way through to northernmost Canada. Many of the Plains bands are found in both the US and Canada. This website is a very valuable listing of the native bands of both Canada and the US. As in the United States, there were Canadian artists who found members of First Nations to be interesting and often “exotic” subject matter for early photography. Photography developed steadily throughout the nineteenth century in Canada. In fact, the first photographic studios in the western hemisphere were opened in Montréal and Québec in 1840. Taste for subject matter, stylistic trends, and photographic techniques developed at the same pace as in the United States. In the 1850s and 1860s there was a renaissance in photographic activity in Montréal. One of the most successful firms was that of William Notman (1826-1891), an émigré from Scotland. Scotland was the land of such pioneer photographers as David Octavius Hill (1802-1870), Robert Adamson (1821-1848), and James Annan Craig (1864-1946). Notman had worked in a drygoods store as late as 1856, and a year later set up a photographic studio. He had learned the Daguerreotype process in Scotland. His business soon became successful because of the elegant and professional portraits he took. Portraiture was the main subject matter in early photography. Notman’s oldest son, William McFarlane, became a partner in the business at the age of 15. He was already an accomplished photographer. In 1884, at the age of 17, William McFarlane made his first of eight trips across Canada to document the spread of white settlement along the Canadian Pacific Railroad. While William McFarlane’s father was renowned for his urban portraiture and pictorialist genre scenes, the son was adept at documenting life in Western Canada, particularly the sweeping landscapes. 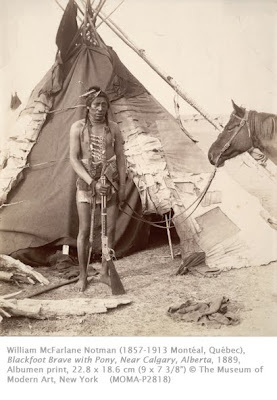 This photograph comes from William McFarlane’s third trip west from 1889 to 1890. On that trip he took his younger brother George as an assistant. In contrast to his more famous dramatic landscapes, this intimate portrait of a member of the Blackfoot First Nation has the quiet dignity and respect that marked the portraits of his father. Notman saw his images of Indians as documents of a vanishing way of life, and therefore valuable historical records. When the Notman studio closed in the early twentieth century, over 400,000 photographs, many of them from William McFarlane’s expeditions, went into the collection of the Musée McCord at McGill University, Montréal. The Sherman Hines Photography Museum, Liverpool, NS, also has a sizeable collection of Notman photographs, both father and son.